It was getting hot and uncomfortable in Judea. Not hot as in the physical climate, but the social and spiritual climate was becoming unbearable. Jesus told his followers that they were heading north. The Master wanted to get back to his old stomping grounds -Galilee. Not that he couldn’t take the heat, but Judah was fast becoming a place where he couldn’t help people like he really wanted. The religious leaders were turning his ministry into a side show, and at this point in his early ministry Jesus wanted no part of that, although it would be hard to avoid no matter where he went, because no matter where he went he healed the sick, the blind received sight, the cripples walked and demons were cast out. Everyone wanted a piece of that action, and the Master was happy to provide it; happy to make people whole; happy to rejoice with them, although the real wholeness that he came to bring was much more than physical healings. Deep down the masses were suffering from mental, emotional and spiritual sicknesses. He especially wanted to bring healing and wholeness to them. That was another reason he wanted to head north. He had a divine appointment with a sick woman at a well. It was not just any woman, it was a Samaritan woman, which meant they must go into the heart of Samaria. It would be a hard pill for his Jewish disciples to swallow. They didn’t like Samaritans very much. It was hard for them to get along. Hundreds of years ago the Samaritans intermarriage with Assyrians turned them into half breeds and that was something most Jews just couldn’t let go of. They had so much to learn. Normally when they traveled north to Galilee they would skirt around Samaria, even though it made the journey longer. This time the trip would take them through the hated peoples terrain. So much to learn. Jesus was smiling as he and his band of brothers crossed the boarder into Samaria. His followers – not so much. It was midday when they stopped for a rest at a well outside the little town of Sychar. The disciples wanted to push into town and try and find something for lunch. Jesus told them to go on without him. “Stinkin’ Samaritans! Probably spit in our pita bread” one disciple whispered under his breath as they headed into town. 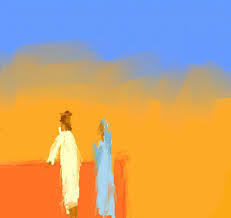 They disappeared over a hill at about the same time that a woman from town topped the hill and made her way to the well. She was all alone. She looked down towards the well and was dismayed to see a man sitting there. While most of the town’s folk went for water in the cool of the morning or evening, she preferred to go at midday. Even though it was hotter, it was also quiet. Peaceful. Her noontime trips for water gave her a chance to be alone with her thoughts, away from the stares of men and disapproving frowns of women. Oh well, she would just have to make the best of a bad situation. Something she was used too. At least this man wasn’t from town; he was clearly a stranger. Getting closer she saw he was really a stranger. She could tell by his clothes and facial characteristics that he was a Jew. “No way!” She thought. Jews never come around here. Lowering her water jar into the well, she was surprised that this strange man spoke to her. This Jew. “Will you give me a drink?” He asked. On the surface it seemed a simple question. He was thirsty and she had water. Beneath the surface it was extremely bizarre. Most Samaritans knew that Jewish men thanked God everyday that they weren’t born gentiles, women, or dogs, and while she wasn’t a dog, she was clearly a woman, and probably considered worse than a gentile. If he drank from her water jar, she knew he would be considered “Unclean” in polite Jewish circles, whatever “unclean” meant. When Jesus asked the woman for a drink, he seemed to have twinkle in his eye, as if he were playing some kind of game where he had made the opening move, and now it was the woman’s turn. She decided to play along. “You are a Jew and I am a Samaritan. How can you ask me for a drink?” Two can play at this game, she thought. Jesus looked into her eyes and explained to her that whoever drinks water from this well will be thirsty again. But whoever drinks the water I give will never thirst again. In fact the living water I give will well up within and streams of water will gush out leading to eternal life. Jesus has said a mouthful, overwhelming the woman’s ability to take it all in. But the phrase, “never thirst again” caught her attention. “Give me this water to drink so that I won’t have to come here everyday to draw water.” She replied. Husband? Husband! What did having a husband have to do with living water. She thought of the five husbands she had had. All the dreams and hopes that came with each wedding, and all the heartache and pain that came with the end of each marriage. She had finally given up hope of finding any fulfillment in the institution and settled for just living with a man. At least she would have a roof over her head and food in her belly. She thought of the strange man’s request again and something began to rise in her. A strange mix of self pity and anger. She didn’t know what to say. She was getting uncomfortable with this man and his words. Hoping to brush him off she simply told him she had no husband and turned back to her water jar. This man was really starting to get on her nerves. She felt shocked and ashamed. How could he possibly know about her past. What business was it of his? She certainly was not going to discuss it with Him. She hastily changed the subject and decided to discuss religion. That should definitely get this Jewish guy going in a different direction. Again, the woman was somewhat overwhelmed by the the man’s words. They sounded nice, and at least he didn’t bring up her husbands again. Both the Samaritans and the Jews were looking forward to a time when the Messiah would come and make things right in the world. That was always comforting to her. She often imagined herself talking with the Messiah and having him resolve all the religious struggles she had within; heal the spiritual sickness she often felt. Not to mention all the personal issues she was dealing with. She blurted out, “some day the Messiah will come and answer all our questions. Did she believe he was the Messiah? Did she she drink deeply of the “living water”? Did she go on to live a life peace and joy? Of fulfillment and wholeness? Was she able to bury the demons of her past? Or did she dismiss the stranger at the well as a crazy person who was just yanking her chain? We don’t know. I think that’s the way John wanted to end this saga of the woman at the well. John also mentioned in his gospel account in chapter four, that many Samaritans came out to give Jesus words a listen, and that they asked this JEW to stay with them a few days, and that many believed. Why did John write this story that the other gospel writers did not include in their books? Why did John write any of the stories that he wrote? He says in chapter 20 that these things were written that you may believe that Jesus is the Messiah, the son of God, and that by believing you might have life through his name. What does it mean to drink the living water that Jesus offers? It means to believe! How about you? Do you believe?